TV is experiencing a surge in what we’re going to dub “sweatshirt boyfriends” — they’re sort of schlubby, likely to have some stubble, cute but more boyish than traditional hunk. There are still plenty of romantic leads that are more classically handsome, or more sophisticated, or more professional, but … blech. Give us a man who eats sandwiches out of the garbage, please. Despite their relaxed attitude toward personal grooming, sweatshirt boyfriends aren’t necessarily Apatowian man-children — Jack (Nick Wechsler) on Revenge owns his own bar and takes care of his annoying teenage brother, Pete (David Walton) on Bent is a successful enough contractor, Alex* (Chris D’Elia) on Whitney is an entrepreneur, and Joe (Luka Jones) on Best Friends Forever is a video game designer. 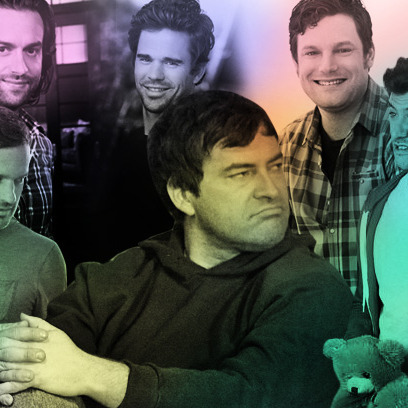 Pete (Mark Duplass) on The League just seems sort of low energy, more depressed than inept, while Nick (Jake M. Johnson) on New Girl and Max (Adam Palley) on Happy Endings fall more in the goofy-slacker camp, though both have started confronting their fears of adulthood, Nick by finally seeing a doctor and Max by learning to enjoy frittatas. Did you know those are like egg pizzas? The newest addition to the SBC (that’s the sweatshirt boyfriend club) is Best Friends Forever’s Joe. He’s sweet and generous and a little corny — which is why the central comic jealousy of the show works. Lennon is torn between her bestie Jessica and her boyfriend, because her boyfriend is cool and smart and respects her and just wants to chill. He is an actual nice guy, which is why Jessica feels guilty for cramping his and Lennon’s relationship. We all wish our friends would date someone that comfy-cozy. The SBC grounds their shows or lends their shows realism: The guys on The League can be pretty bonkers, but Pete seems relatively normal; Whitney is often an unbearable, nasty person to be around on Whitney, but Alex is more humane and less sour. With the exception of maybe Max, who tends to be ridiculous, these characters are positioned as the most “normal” people on their shows. They’re the sanest, or at least the least crazy; they struggle with money; and even when they’re professionally accomplished, it would be tough to call any of these characters “powerful.” The bizarre Jess, who sings when she’s nervous and spends a lot of time with glitter, might be the heroine of New Girl, but we all know a Nick. The SBC reflects our desire — our male desire, our female desire, our sexual and platonic desire — to see someone familiar on television, someone like us. They’re the accessible crush, the more attainable of the species, the guy you could maybe actually date or be friends with. Especially since you might be able to steal that hoodie. * This post has been corrected to show that Chris D’Elia’s character on Whitney is named Alex, not Chris.